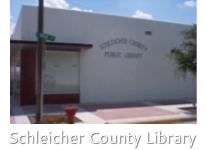 The Schleicher County Public Library is proud to offer the following services. Ask a library staff member for more details. Books, both fiction and non-fiction, including the latest best sellers!